1 - the least rub. 4 - the most. Note how much darker they get. That’s a great question because on more than one occasion, I’ve been served ribs that seemed to have little or no rub on them and typically, I tend to use a lot. I’m also frequently surprised to read rub recipes that claim to be “enough for 4 slabs,” but yield tiny amounts of the stuff. Have I been over-rubbing my ribs? Barely any. This was a sprinkle of rub. I’d compare it to, say, 4 or 5 turns of a pepper grinder. Stained. In this case, I put a good sized spoonful of rub on each side and really had to spread it around. The ribs were red with rub, but there was no density to it. Think of it as staining the ribs. My Usual. This is enough rub to make sure all surfaces (including the sides) are completely covered with rub. 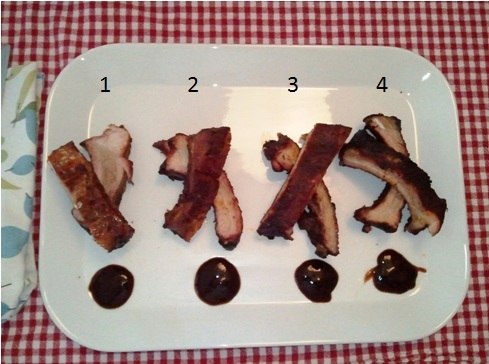 There may even be a dry spot or two, but no rub pours off when the ribs are moved. Caked. Self explanatory! Somewhere under all that rub were some pork ribs. There were lots of dry spots, and if I tilted the ribs, some dry rub would roll right off. Then I cooked them all at the same time, using the 3-2-1 method. The first thing I noticed (see the picture) is that the more rub you use, the more burnt the ribs look when they’re done. Note, we’re just talking about appearances. 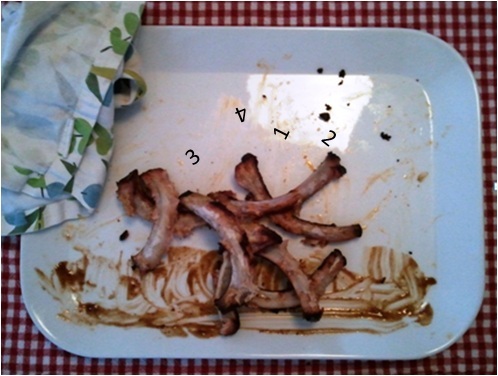 All the ribs were slow cooked the same way for the same amount of time, and were perfect. The brown sugar in the rub simply gets dark when cooked, and gets a burnt look to it. I can see how if I were a restaurant owner, I might shy away from using a lot of rub, or I’d risk having people glance at the ribs and pre-suppose that they were over-cooked. I tried all of the ribs twice. First without any sauce, and second with just a small amount of my favorite sauce. Trying them without sauce led me to three conclusions. First, that more rub is better, up to a point. The problem with the “caked on” rub was that I actually got a few sandy bites. Delicious sand, yes. But let’s face it, that’s not a texture anybody wants. Second, the ribs with barely any rub were surprisingly good. Shockingly good. So, it’s not surprising that some great restaurants are serving their ribs very light on rub. It turns out slow-cooked pork tastes great without much help. Big surprise. I think I even preferred the barely there rub to the stained version. Third, the ribs got progressively juicier with more rub. While I didn’t like the “caked on” rub for the reason above, it did have the most moisture. And the ribs with hardly any rub were the most dried out. I can’t help but conclude that the bark the rub creates helps hold some of the moisture in. In the end, they're all good, right? That was deciding factor in the end. The “usual” amount of rub – where I evenly cover the ribs in rub, but not so much as to have it pouring off them – was the best because it had a best flavor while also creating a nice, moisture-trapping skin. I agree, more is better. I dust off excess before cooking. The slow cooked (whole) pork I’ve had in Slovenia and Croatia have been excellent, without much beyond salt and pepper.